The Sabres are locked and loaded and are ready to make some noise in the Atlantic Division. With a revamped roster and a promising young core, Buffalo have their sights set on claiming the division crown and making a run at the Stanley Cup. They will have to overcome division rivals the Detroit Red Wings and the Boston Bruins on their quest for hockey glory. Grab your Buffalo Sabres and be there to cheer on your team on their championship journey. The Sabres will be looking to turn things around after a few underwhelming campaigns. The last time they made it to the playoffs was at the end of the 2010-2011 season. Now is the time for them to bounce back. If you want to see how the season pans out for them, book your Buffalo Sabres tickets and watch them play live. Chris Drury steps up for the Sabres - In the 2007 NHL playoffs, the Sabres were up against the formidable New York Rangers. The series was tied at 2-2 when the two teams moved to the HSBC Arena for Game 5 on May 4, 2007. Maxim Afinogenov scored the winning goal in four minutes and thirty nine seconds in overtime to win the game for the Sabres but it was Chris Drury’s goal that was more important. The Rangers were just seven seconds away from taking a 3-2 lead when Drury stepped up to score the goal that tied the game at 1-1. Had he not scored that goal, there would have been no heroics from Afinogenov. The Sabres won the next game to take the series 4-2. May Day - The Buffalo Sabres came into the 1993 Divisional Semifinals against the Bruins on the back of suffering five straight eliminations at the exact same stage of the season over five years. The Bruins were responsible for three of those losses. It was a jinx that needed to end. The Sabres took a 3-0 lead in the series and the two sides squared off at the Buffalo Memorial Auditorium for Game 4. Brad May scored the winning goal in OT to ensure the Sabres’ progression past the Divisional playoffs finally. Rick Jeanneret’s iconic May Day! May Day! May Day! call has also gone down in history as one of the most memorable moments in NHL. The Buffalo Sabres have developed rivalries with multiple teams over the years. The rivalries against the Boston Bruins and the Toronto Maple Leafs however, stand out. Sabres-Bruins Rivalry - The Buffalo Sabres and the Boston Bruins have been members of the same division ever since the former joined the NHL in the year 1970. The rivalry between these two sides really kicked off between 1982 and 1993 where these two sides met in the playoffs on six occasions. The Bruins won each of the first five series while the Sabres came out on top in 1993. They have since met twice in the playoffs. In 1999 the Sabres won whereas the Bruins won in 2010. That was the last time these two teams met in the postseason. Sabres-Maple Leafs Rivalry - The Buffalo Sabres and the Toronto Maple Leafs have a very heated rivalry which is known as the Battle of the QEW. This rivalry stems from the fact that the two cities are very close and connected through the Queen Elizabeth Highway. The Sabres and the Maple Leafs have met in the postseason only once and the former came out on top on that occasion. The Sabres also lead the Toronto Maple Leafs in the head to head record. The Maple Leafs however, have been the more successful of the two sides having won thirteen Stanley Cups compared to the Sabres’ zero. Opened in 1996, the KeyBank Center (Formerly the First Niagara Center)is everything a modern arena should be. Great food. Great drinks. Excellent sight lines. It offers great fan amenities as The Labatt Blue Zone, which is made up of timeline of Sabres history and offers great views of Downtown Buffalo. Take in the views and get your first look at the future of Buffalo with Sabres preseason tickets. The KeyBank Center took the place of the Buffalo Memorial Auditorium and has been one of the most famous venues in the entire country ever since. Garth Brooks, Trisha Yearwood, Blake Shelton, Kanye West, the Tran-Siberian Orchestra and AC/DC among other major names from the world of music have performed here regularly. On top of that, it has also hosted multiple WWE pay-per-view and weekly World Wresting Entertainment events too. Dominik Hasek played for the Buffalo Sabres between 1992 and 2001 and during that time, he delivered some stellar performances. As a Sabre, he won half a dozen Vezina Trophies, two Lester Pearson Trophies, two William Jennings Trophies and two Hart Trophies. Gilbert Perreault spent his entire career with the Sabres. He played 1,191 games, scored 512 goals, recorded 814 assists and amassed a whopping 1,326 points which are all Sabres records. Perreault also made eight All-Star and one Challenge Cup appearances. Rick Martin was a member of the Buffalo Sabres roster between 1971 and 1981. With Gilbert Perreault and Rene Robert, he was part of the famous French Connection. He scored 382 goals and amassed 695 points for the franchise. The Sabres have retired his number 7. The Buffalo Sabres have a lot of work to do this year and they will have to hit the ground running to get some momentum on their side. Check out the NHL schedule for the 2018-2019 season and get your cheap Buffalo Sabres tickets to watch them in action. It is all set up to be a very important campaign for the Sabres. Our process for purchasing cheap Buffalo Sabres tickets is simple and fast. There are so many online ticketing sites, that it can be hard for customers to find the right place to buy Buffalo Sabres tickets at the cheapest price. At ScoreBig we think of our customers first and foremost. We offer daily deals for Buffalo Sabres events, so our customers can get the best seats for the best prices. ScoreBig will always go above and beyond to offer the cheapest Buffalo Sabres tickets on the market. The Buffalo Sabres schedule above, displays all available events for 2019 and 2020. Once you find the event that you would like to go to, click the red “Get Tickets” button. It is located on the right-hand side of the event listing, it will take you to an Buffalo Sabres event ticket page. ScoreBig's event ticket page will display all available Buffalo Sabres tickets for that event. On the event ticket page to help with your search for the right Buffalo Sabres tickets, use the filters at the top to select quantity, price range, and more. There is also an interactive seating chart so you can pick where you want to sit. When you are ready to buy a ticket, click on the listing, and you will be directed to ScoreBig's checkout page. Upon completion of the information fields, your order will be processed and your Buffalo Sabres tickets will be delivered via email, mail, or to your mobile device. What makes ScoreBig’s site stand out from the rest? We are constantly analyzing our competitors to improve our site, service, and prices. ScoreBig.com employees strive to offer the best process and experience to buy cheap Buffalo Sabres tickets. Our goal is to get you the best seats to Buffalo Sabres events. We offer daily discounts on our site and for special promotions check out our newsletter. If there are no Buffalo Sabres events currently available, you can use our search feature at the top of the page to see a list of all popular events going on near you. 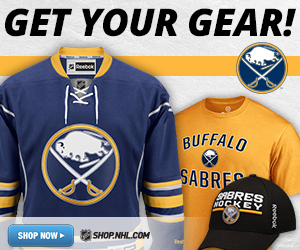 No matter your price point, we have all the best deals and discounts on Buffalo Sabres tickets. For more information on prices of Buffalo Sabres tickets and the schedule for Buffalo Sabres, check out our listings above. The last thing you want to find out is when the Buffalo Sabres event you wanted to go to is sold-out. Don’t worry in many cases ScoreBig has affordable tickets to sold out events. We sell tickets from GA all the way to premium seating and parking. Skip the scalpers in the parking lot and get your tickets online from top Buffalo Sabres ticket brokers. We get you in all events, buy your Buffalo Sabres tickets here from a brand that many trust and rely on for all their ticketing needs. ScoreBig offers a 100% money-back guarantee. If you have been in search of cheap tickets for Buffalo Sabres, ScoreBig by far is the best option. That’s why ScoreBig has more loyal customers than any other ticketing site. Shop at ScoreBig for safe and secure Buffalo Sabres event tickets.